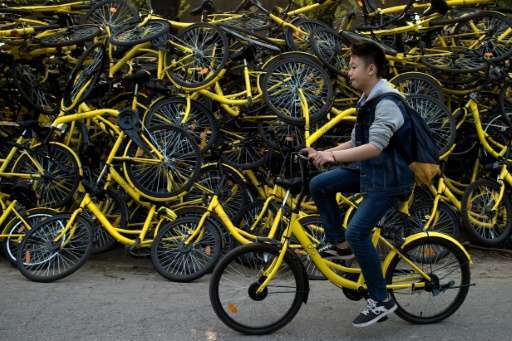 A booming rental bike business has flooded China's streets with packs of cyclists, but their habit of going the wrong way and abandoning their rides anywhere is causing havoc. The authorities, scrambling to catch up, are considering new regulations to curb the chaos—from capping the number of bikes to even barring people they consider too big or too small for bicycles. Once the ride's over, they simply park the bike and apply the lock. 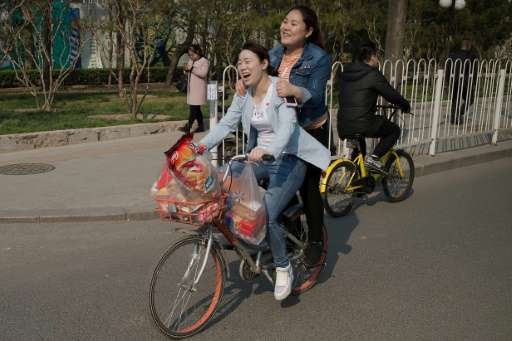 "I like the convenience of cycling instead of taking the subway, but the system backfires when the sheer amount of bikes causes traffic jams in some areas," 21-year-old Beijing student Zhang Wei told AFP. "Many people also don't know how to bike very well and it is annoying when they swerve around or cycle in the wrong direction," said Zhang. 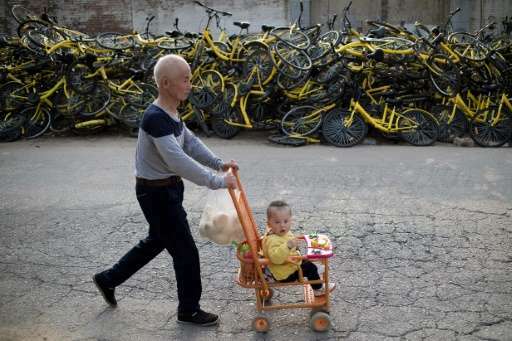 Authorities in China are considering new regulations to curb the cycling chaos—from capping the number of bikes to even barring people they consider too big or too small for bicycles. Some 30 different providers wrestling for market share in China have placed more than three million bikes on streets around the country, according to state media. China's Ministry of Transport on Monday released a draft proposal on rules requiring local governments to better manage the booming bike-share industry. 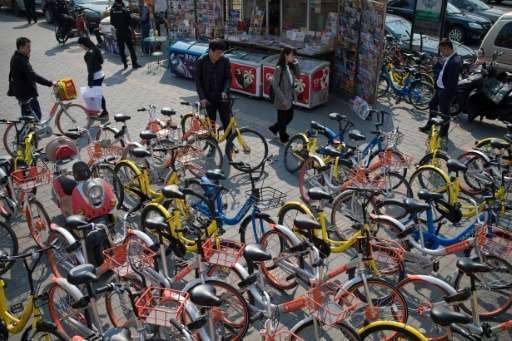 Jeffrey Towson, a professor of investing at Peking University, said good rules would "shift responsibility for handling bad behaviour from the police to the bike-sharing companies themselves." "I doubt the police will continue gathering thousands of bikes and putting them in lots," Towson told AFP. The city of Shanghai is considering a more drastic approach to limit the chaos caused by bikes: Barring people authorities consider either too tall, too short or overweight for the average bike frame. 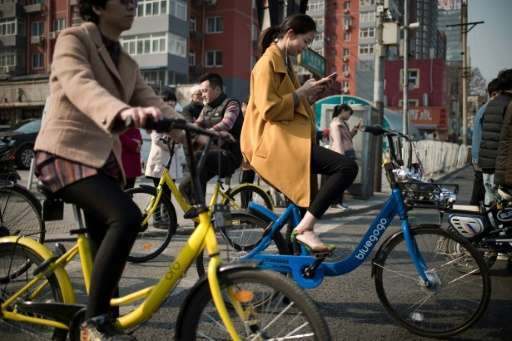 In China's cities the public can simply use their smartphone to unlock and use a shared bicycle on the street and ride it to their desired destination. 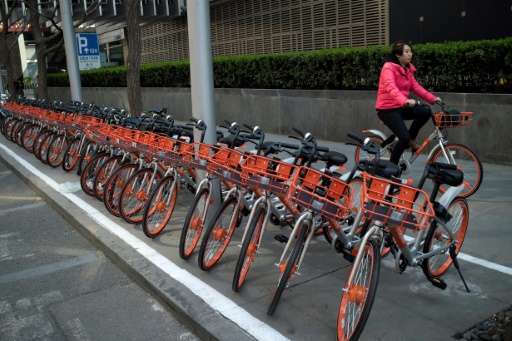 "We were the first in the industry to work with local businesses and regulators to develop specially designated parking spaces for our bikes... We have over 10,000 of these in China now, and will roll out thousands more in the coming months," a Mobike spokeswoman told AFP. 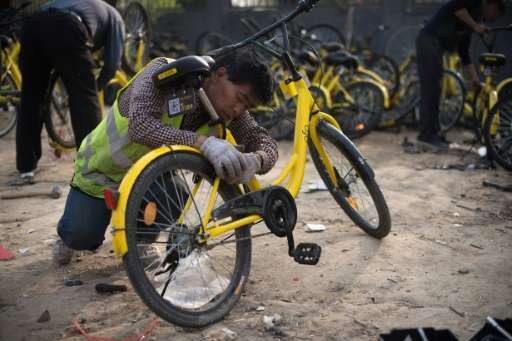 "The government should require all companies to install GPS functions on bikes in order to meet consumer demands and control random parking, vandalism and theft," Zhang told AFP. 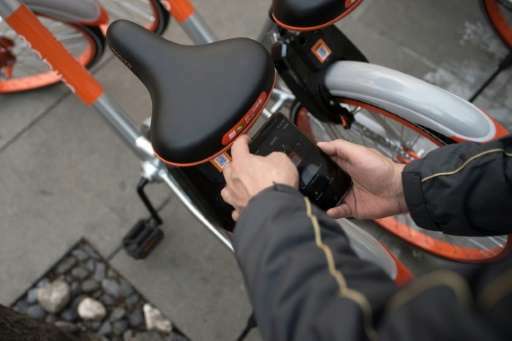 Mobike's GPS-enabled system shows locations of idle bikes. The company has a reward system encouraging users to ride bikes from low-traffic to higher-traffic locations. 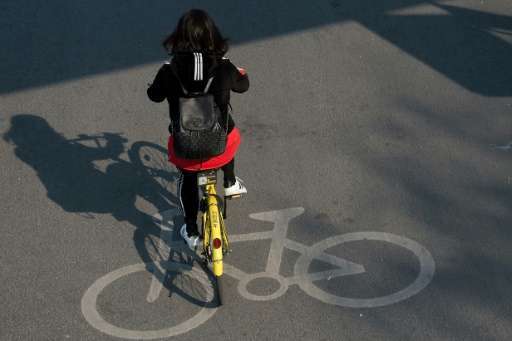 Soaring numbers of cyclists are causing problems in China's cities because many simply leave the bikes in the middle of sidewalks or abandon them haphazardly on freeways. Clearly the problem is space. Very valuable and hence not attended to. One suspects that multi level spots will be very desirable in answering this question. With all the people and cheap labour, couldn't they find someone to make a bike carrier? Something like a big trailer that holds 40 bikes. Pick them up where there are too many bikes and move them to where they are needed. That could be a full time job for a few dozen people.